Gorod have been no-so-quietly bubbling beneath the surface of the technical death metal scene for some time now. Earlier albums such as Leading Vision (2006) put them on the map as far as those with an ear to the underground were concerned and, their last album, the more refined and conceptually-driven A Perfect Absolution (2012) served as somewhat of a breakthrough for the French band. However, it’s A Maze of Recycled Creeds that proves them more than a match for their contemporaries and which will likely go down in the metal annals as the band’s greatest triumph. Right from the start, it’s clear there’s something a bit different about A Maze of Recycled Creeds. Maybe it’s the addition of, new drummer, Karol Diers (Juggernaut, Hell in Town), but more likely it’s the fact that Gorod have finally managed to translate their always-frenetic and off-kilter sound into something truly progressive and inspired. A Maze of Recycled Creeds finds a sublime sense of melody layered atop the usual rhythmic gymnastics that have always been fundamental to Gorod’s particular tech-death take, and their music is all the better for it. A Maze of Recycled Creeds hasn’t lost any of the edge of Gorod’s earlier releases, but it doesn’t feel the need to beat the listener over the head with it either. The record’s production is more stripped-back compared with the band’s last few releases and it sounds a lot more natural, especially when extending the comparison to usually machine-tight world of tech-death. 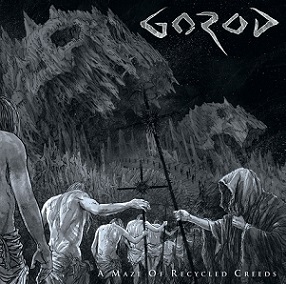 The arrangements on A Maze of Recycled Creeds are no less complex or instrumentally dazzling, but what stands out about the tone of the record, more so, is that Gorod sound like a band playing their instruments rather than precision automata. This, combined with the record’s more-contemplative tone, results in something whose overall effect is more akin to what you would of a more reserved and layered band like Leprous, rather than the likes of Necrophagist or Spawn of Possession. A Maze of Recycled Creeds is at once a more intellectual, contemplative and organic record that pushes both Gorod and the technical death genre into more expansive territory, while still maintaining their traditional complexity and aggression. This is an album that demands to be worshiped. This entry was posted in Featured Review, Reviews and tagged a maze of recycled creeds, Death Metal, featured, Gorod, progressive death metal, Technical Death Metal. Rad album, and after the hit-and-miss "Absolution," this seems like a return to form of sorts. seemed heavily like a leading visions throwback. in the best way humanly possible.